The speaker of Tehran CreativeMornings will not be a person this month. It will be the representative of a group whose concern has been to protect the creatures that need our attention to survive for more than 15 years. This group is called “Iranian Cheetah Society” and has been active in the field of environment, variety and protection of large carnivores in Iran. This group has several activities both in teaching and studying and has been one of the most active NGO’s with the highest feedback supporting Iran animals and environment that has won several internal and international awards. We will be listening to Ms. Leila Ghasemzadeh, the CEO of this institution, about the survival and significance of protection of endangered species and the challenges to help this NGO survive as well, on 7th of July. 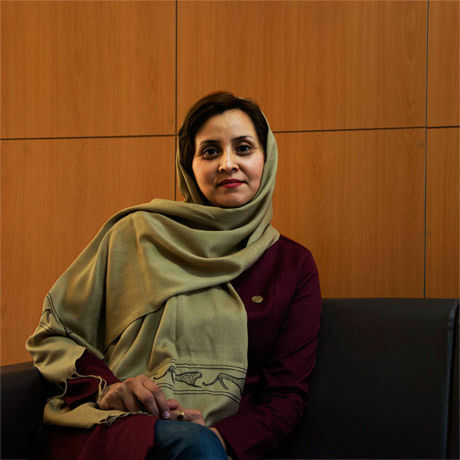 Ms. Ghasemzadeh, 40 years old, has studied Landscape and come to our beautiful Tehran recently. She has taken the responsibility of managing the Persian leopard association since the beginning of the year. She is a kind of powerful, intellectual woman who has been concerned about the environment. She has also been doing voluntary work in this field over 14 years. سخنران این ماه صبح خلاق تهران، یک فرد نیست، نماینده‌ی گروهی است که تمام هم و غمشان، برای بیشتر از ۱۵ سال، حفاظت از موجوداتیست که بقایشان نیازمند توجه است! گروهی فعال در زمینه محیط زیست، تنوع زیستی و حفاظت از گوشتخواران بزرگ جثه ایران، به نام «انجمن یوزپلنگ ایرانی». این گروه فعالیت‌های متعددی در دو حوزه آموزش و تحقیقات دارد و یکی از فعال‌ترین و پربازخوردترین موسسات مردم‌نهاد حامی حیوانات و محیط زیست ایران و برنده جوایز متعدد بین‌المللی و داخلی است. شانزدهم تیرماه، به سخنان خانم لیلا قاسم‌زاده، مدیرعامل این موسسه در خصوص بقا و ضرورت حفاظت از موجودات در حال انقراض و همچنین پیچیدگی‌ها و مشکلات حفظ بقای موسسه‌ای مردم‌نهاد و غیر دولتی گوش می‌دهیم. خانم قاسم‌زاده ۴۰ سال سن دارد و در رشته فضای سبز تحصیل کرده و اخیراً از شهر زیبای شیراز به تهران زیبای ما آمده و از ابتدای سال مدیریت انجمن یوزپلنگ ایرانی را بر عهده گرفته است. زنی قدرتمند، با سابقه، منطقی و دغدغه‌مند در حوزه محیط زیست که بیش از ۱۴ سال در همین حوزه فعالیت داوطلبانه داشته است.